Synopsis: USA vs Al-Arian revolves around whether it is possible for a man like Sami Al-Arian to receive a fair trial in the United States given the current hostile environment against Muslims and the strong US support of Israel. It presents democracy in a new light in a post-9/11 culture of fear, where "security measures" trump free speech and punishment is meted out in the name of protection. It is an example of how the American government’s hunt for terrorists is a struggle that can be seen from multiple angles. 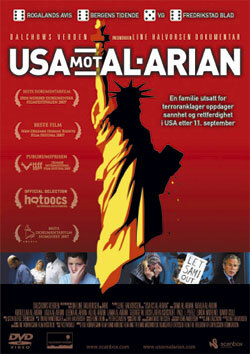 The film: ”USA vs AL-ARIAN” is an intimate family portrait that documents the American-Muslim family Al-Arian's desperate attempt to fight terrorism charges leveled by the US Government. In February 2003, university professor and pro-Palestinian civil rights activist Sami Al-Arian was arrested in Tampa, Florida, charged with providing material support to a terror organization. For two-and-a-half years he was held in solitary confinement, denied basic privileges and given limited access to his attorneys. While the Bush administration considered this a landmark case in its campaign against international terrorism, Sami Al-Arian claims he was targeted in an attempt to silence his political views. The film follows Sami Al-Arian’s wife Nahla and their five children throughout his 6 month-long trial. It is an intimate family portrait that documents the strain brought on by the trial, a battle waged both in court and in the media. In the film a tight-knit family unravels before our very eyes as trial preparations, strategy and spin consume their lives. This is a nightmare come to life, as a man is prosecuted for his beliefs rather than his actions. The evidence presented against Dr. Al-Arian consisted mostly of wiretapped phone calls, his political speeches and his writings. During the trial, the US government brought witnesses to terror attacks in Israel, but did not provide any evidence directly tying Dr. Al-Arian to terrorism or to any criminal activity. There was no evidence that any violent act took place, or that any violent act was ever planned to take place in the United States. The jury did not convict him on any of the counts against him. Language: English with Norwegian subtitles.